Feel like anything is possible on the most confident and proven deck in women‰Û¡ÌÝåÁÌÎÌÌ´åÈs snowboarding. 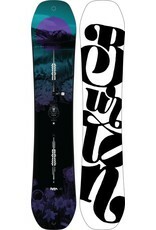 The Burton Feelgood‰Û¡ÌÝåÁÌÎå£Ì´å¢ is the defining force in women's snowboarding. Carbon Highlights are the biggest bonus, shaving serious weight while making the board more playful and lively from tip to tail. Squeezebox High core profiling also utilizes carbon to reduce weight further, and makes the board more poppy and precise for Ferrari-like handling. Directional shaping navigates easily through variable conditions, making this one board that truly conquers all. Available with the stable suspension of camber or the rocker-infused freedom of Flying V‰Û¡ÌÝåÁÌÎå£Ì´å¢, the Feelgood is a perfect match for aspiring pros or just riders who demand every advantage.